Yesterday evening was absolutely perfect with the sun beating down and a slight breeze keeping the temperature in check. After work I headed straight down to Rhossili where I was quite surprised to find the place almost deserted. You'd think people would have been out savouring every last second after the torrid conditions recently. Anyway I wasn't complaining and enjoyed a peaceful walk down to the head where I picked up a group of thirty to forty Gannets fishing in the middle of the channel. Scanning left a separate group of three birds were soaring and diving right off the coast at Tears Point, by far the closest in I have ever seen Gannets off Gower. Preying that they would stay put I worked my way closer only to be confronted with the same limitations that have prevented me from getting any pictures of the species to date. Against water my camera simply wont lock on or expose the birds correctly, so a new tact was definitely in order. A quick slither down an almost vertical slope and I had the birds against the sky. Now all I needed was some luck, and boy did I get it. For over an hour I was treated to the sight of these magnificent birds soaring past me and at times right overhead. The small group of three birds slowly grew to at least fifteen individuals until I was almost surrounded. About half way through a pod of Dolphins appeared beneath them and were seen to breach on several occasions. Even better was to come though as they started surfing the bigger of the waves. It was a simply magical way to spend an evening. On the walk back to my car I spotted this Stonechat perched obligingly on a stone wall. The colours are exactly as they were at the time due to the sun being barely visible above the horizon. A few more days like this would be very welcome let me assure you. 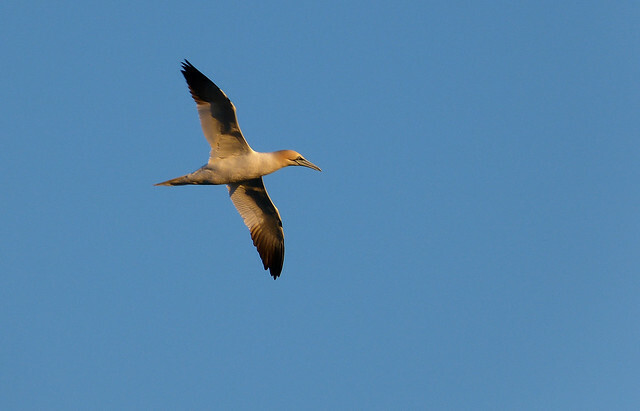 Superb photos of Gannets ... which we used to watch most easily up in Yorkshire off Bempton Cliffs. How exciting to see the Dolphins off Gower. And yes, more of this sunshine would indeed be great! A magical time spent in the company of those Gannets, and the dolphins a bonus. Doesn't get much better. 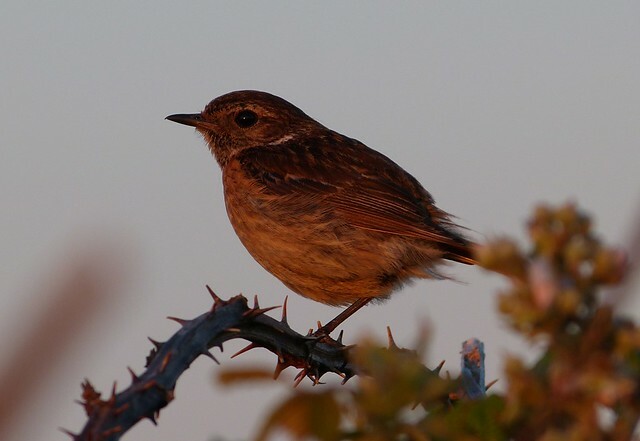 Wonderful pictures, I thought the gannet was the best until I saw the third picture, that stonechat is just magic. Lovely shots, made extra special by the buttery evening light. I had a Gannet fly within ten metres overhead of me on the Langland to Caswell path last summer, but of course I didn't have my big lens with me. Caroline - that reminds me I really need to go to Bempton Cliffs again. Went ages ago before I had a camera. Keith - thanks. Can never have enough Gannets and Dolphins. 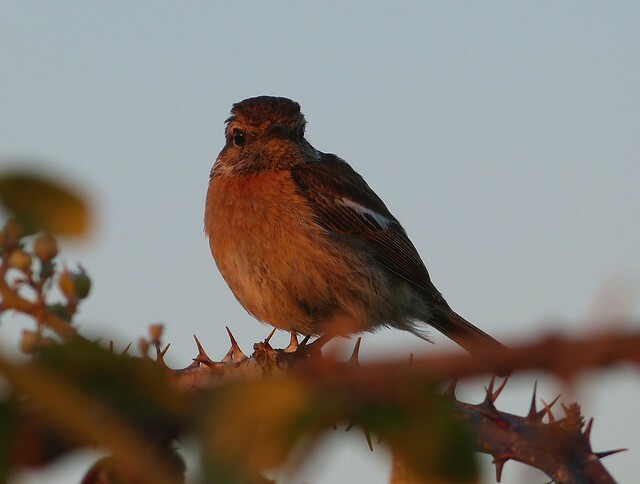 Gillian - the sunset certainly helped to light up that Stonechat. Jeremy - thanks. 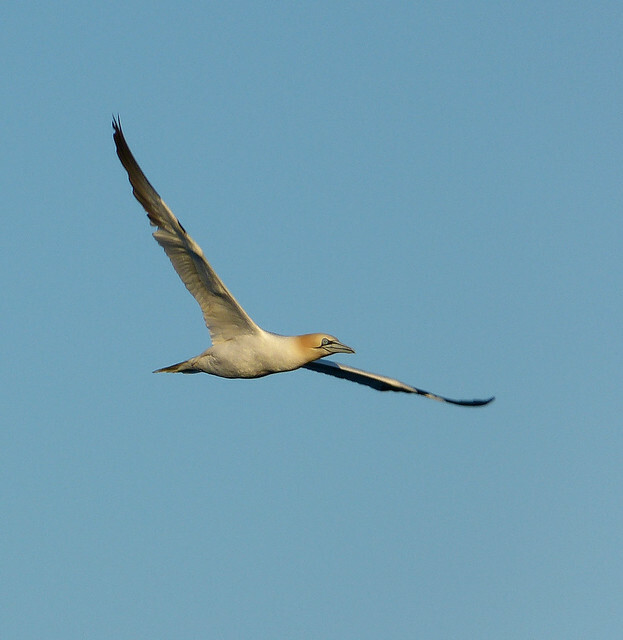 Might just be me but I'm sure we've had a good year for Gannets on Gower.